Computerized maintenance management software (CMMS) is an investment for your organization, and like any investment, you want to see a return on your money. 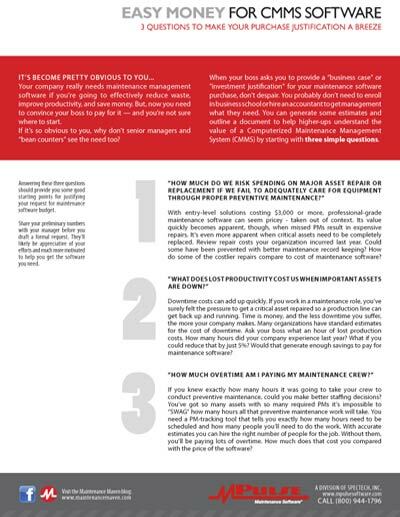 You know computerized maintenance management software can help streamline your company’s maintenance operations, but how much can you really save? Successful CMMS implementations typically return 3 to 5 times the initial investment in less than three years. The average gross savings on maintenance expenditures range from 10% to 40%. Those numbers are impressive, but where do they come from? In most cases, five categories constitute the bulk of the savings. Labor is a big part of any organization’s budget. Personnel management starts with appropriate staffing levels. 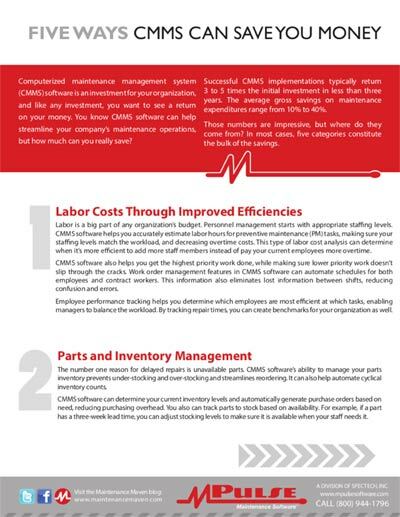 CMMS software helps you accurately estimate labor hours for preventive maintenance (PM) tasks, making sure your staffing levels match the workload, and decreasing overtime costs. This type of labor cost analysis can determine when it’s more efficient to add more staff members instead of paying your current employees more overtime. Computerized maintenance management software also helps you get the highest priority work done, while making sure lower priority work doesn’t slip through the cracks. Work order management features in CMMS software can automate schedules for both employees and contract workers. This information also eliminates lost information between shifts, reducing confusion and errors. Employee performance tracking helps you determine which employees are most efficient at which tasks, enabling managers to balance the workload. By tracking repair times, you can create benchmarks for your organization as well. The number one reason for delayed repairs is unavailable parts. CMMS software’s ability to manage your parts inventory prevents under-stocking and over-stocking and streamlines reordering. It can also help automate cyclical inventory counts. CMMS software can determine your current inventory levels and automatically generate purchase orders based on need, reducing purchasing overhead. You also can track parts to stock based on availability. For example, if a part has a three-week lead time, you can adjust stocking levels to make sure it is available when your staff needs it. When your organization’s equipment hasn’t been maintained properly, you’re going to experience more breakdowns. That translates into lost dollars and intense pressure on the maintenance team to get production running again. 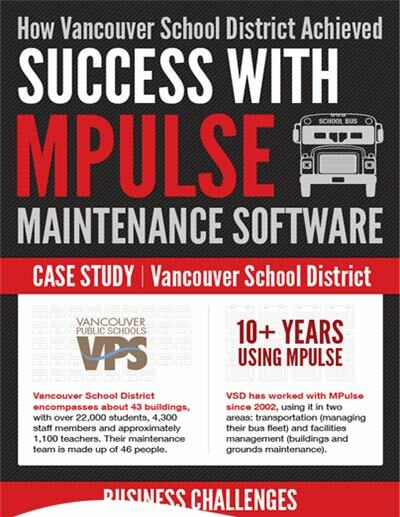 When you use computerized maintenance management software to schedule and track PMs, you’ll reduce emergency maintenance issues and unexpected production stoppages. This, in turn, cuts overtime costs for emergency repairs and reduces production losses. You can also schedule maintenance for off hours by tracking equipment use time. CMMS software generates a schedule of preventive maintenance tasks, making it simpler to follow the manufacturer’s guidelines. Properly maintained assets perform more efficiently, use less energy, and fail less often—extending their usable life. CMMS data also helps organizations make effective replace-or-repair decisions. Maintenance software can track not only the age of the equipment, but the miles, hours, life-to-date repair dollars, and many other metrics—helping you decide when it becomes cheaper to replace an asset instead of repairing it. In manufacturing industries, CMMS software helps reduce scrap and rework by keeping equipment operating efficiently, reducing emergency production breakdowns, and avoiding catastrophic material losses. Maintenance and inspection schedules generated from CMMS reports help spot issues before they occur. Regular servicing also ensures equipment is properly calibrated and lubricated. Like most successful investments, CMMS benefits compound over time. 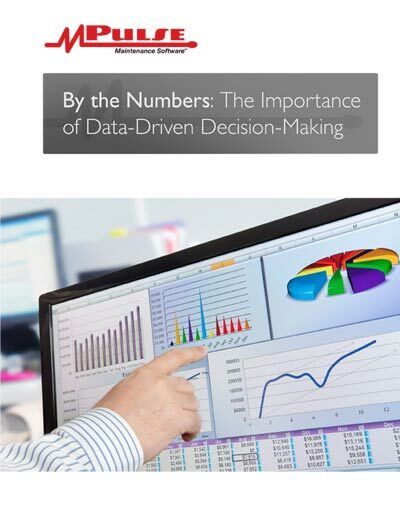 As your data becomes more comprehensive, your organization becomes more efficient and the return on investment climbs. Computerized maintenance management software helps you capture key data and turn it into reliable information to help make cost-effective choices about asset management.